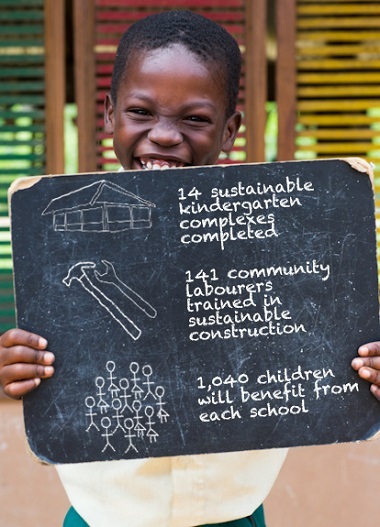 In 2008, the Building Better Schools programme began with a brief to design a sustainable, child-centred kindergarten complex that would be a blueprint accepted as a building standard in Ghana and rolled out through the government’s national school-building programme. Throughout a nine-year partnership with international design and engineering firm Arup, we have developed, evaluated, optimised and replicated a model kindergarten complex that meets the needs of the government’s early-childhood care and development policy, which was enacted in 2007. 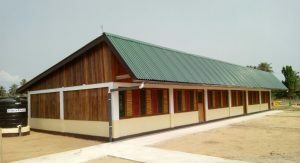 The 14 schools already completed by the Sabre-Arup partnership have won domestic and international recognition as some of the very best kindergarten schools in Ghana, and have been profiled as exemplar projects at global conferences on quality learning environments, community based construction, and safe school construction. 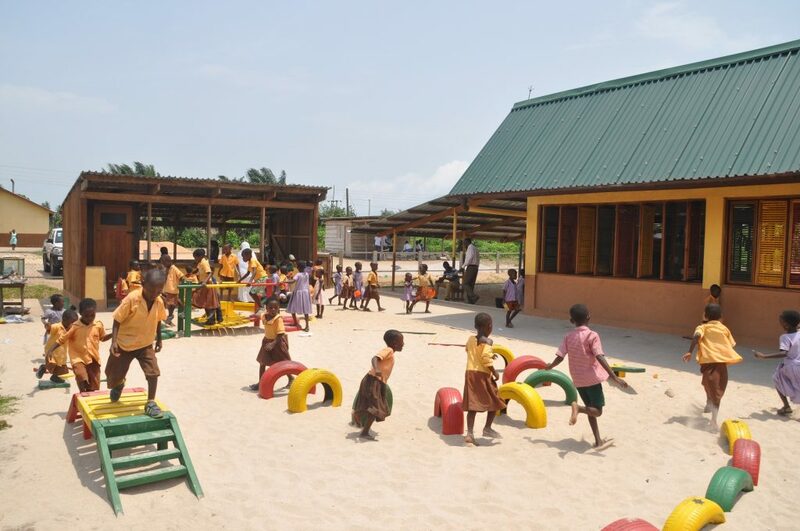 Two of the schools built, were Ghana’s first Centres of Excellence Kindergarten schools, built on the campus of the two Colleges of Education (OLA College in the Central Region and Holy Child College in the Western Region) that offer the diploma in Early Childhood Education. These schools not only provide quality facilities to local children but will also showcase an optimal learning environment to support Sabre’s Transformational Teacher Training programme, exposing student teachers at the Colleges of Education to practical experience early on in their studies. When you step inside a Sustainable Kindergarten Complex you truly understand the effect of the functional design, how environmental impact and sustainability has been prioritised and realise the social impact these structures are making on a communities throughout Ghana. Our unique performance-based design for the classrooms provides a high quality learning environment in terms of day-lighting, natural ventilation, temperature and acoustics. The classrooms are complemented by external teaching areas, a staff room, toilets and kitchen. These facilities provide a self-contained, functional education complex with teaching spaces in line with international best practice. Colour, scale and layout are used to create a child centred hub of playful exploration, and promote an inspiring learning environment unprecedented among government schools in Ghana. Each year school buildings collapse or incur significant damage due to natural disasters, resulting in deaths and injuries to teachers and children and disruption to their education. Recognising the risk of earthquakes in southern Ghana, our model school structure is designed as a modular frame to resist seismic loads. The choice of construction typology reflects local practices and makes innovative use of local materials. 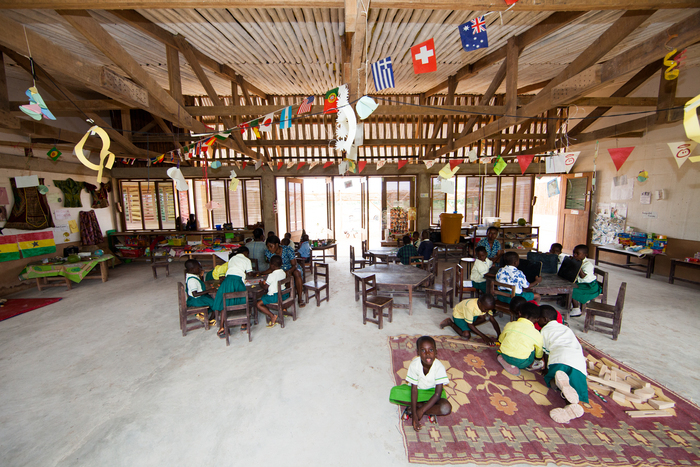 As a result the kindergartens are constructed by a local workforce that includes members of the host village community. Skills training is provided to ensure the quality of construction, which also increases the livelihood opportunities for construction workers and will ensure the schools continue to be maintained in the future. Our ambition over the next five years is to build at least 15 schools ourselves, and upgrade at least 18 existing schools, but expect these numbers to be significantly higher when collaborations with other implementing partners are included. Our ultimate goal is to improve access and quality of early years education in Ghana and beyond, both through our own projects and via collaborations with other partners, giving as many children as possible the best start to their education.